Saddle up for 5-reels of fun at Horsing About Slots! Trot for treasure with the golden horseshoe & cowboy hats to multiply wins! The clue’s in the name, Horsing about Slots has a decidedly equine theme. The reels are packed out with horsey characters including cowboy hats, lucky horse shoes and riding boots. There are 25 paylines across the 5 reels and plenty of ways to win with additional bonus features too. The special symbols to look out for are the Cowboy Hat which is Wild and the Horseshoe which is the Scatter. The Wild can be subbed in for all other characters except the Horseshoe and doubles all wins when it appears on the pay line. The maximum jackpot is also paid out when you spin 5 Hats across a winning payline. The Horseshoe Scatter activated the Free Spins Bonus Round within this game. If you spin three or more Horseshoes across your reels you’ll win your free spins and these can be retriggered from within the bonus round. 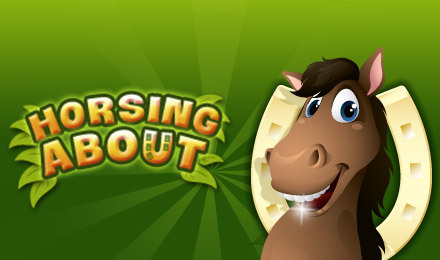 Horsing About Slots has a fun animal theme and a bonus round enabling extra coin wins.